After installing the software you should see a Chinese Toolbox shortcut on the desktop and one on the Start menu. Double-click on the Chinese Toolbox icon on the desktop, and the program will begin to load. The first thing to appear is the license agreement notice. Like the readme.txt file, this will appear only once the first time you run the program. The license agreement also exists online. Click on “Yes” to proceed with the first launch. Chinese Toolbox will try to connect to a server (CT Server) to retrieve global settings, such as the currently available version of the program. After the program accesses the server, program data will begin to load from disk. While loading, the splash screen will appear, and the loading progress bar will advance twice, first for the word dictionary (cedict_ts.u8) and second while loading Chinese Toolbox data files. 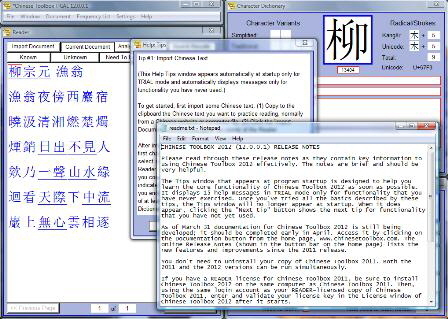 If Chinese language support is not installed on your computer, small boxes will appear where Chinese characters would normally appear. This indicates there's no font on your computer that can display Chinese characters. If such is the case, refer to Installing Chinese language support. The first time you launch the program, a “Chinese Toolbox” folder is created in your documents (i.e., My Documents) directory. The program then copies ChineseToolbox.dat, ChineseToolbox.cfg, readme.txt, and ChineseToolboxLicense.txt into this directory from the program directory. Each local account on the computer gets its own set of Chinese Toolbox data files when the program is first launched using the account. Other files are written into your Chinese Toolbox folder after you begin using the program. 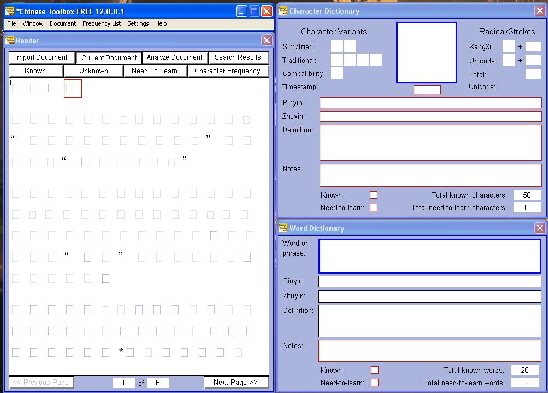 Once loaded, readme.txt will appear in your computer’s default text editing program (usually notepad.exe). This will appear automatically only once. You should read through the readme.txt file before closing it, as it contains the most essential information for getting started with Chinese Toolbox. After closing this window, you should read and understand at least the first few tips shown in the Help Tips window. Each Help Tips message will appear only until you’ve actually tried the functionality described by the tip. Thereafter, the message will not appear again automatically. If a tip is too brief or unclear, click on the “Illustrated help on this tip” button. A web page for the tip will appear with more information, illustrations, and examples to help clarify the concept. especially the new Chinese Toolbox 13.1.0.5.